Considered as one of the greats of the European stoner rock scene, MARS RED SKY have gained international recognition thanks to a unique sound imprint based on thick infectious grooves and melodic aerial guitar riffs. This is truly a one of a kind experience, all wrapped up in Julien Pras’ ethereal vocals, Matgaz’ powerful drumming and Jimmy Kinast’s pachydermic bass lines. Somewhere between the heaviness of doom and the haunting relics of 70’s psych pop, the Mars Red Sound first intrigues, then irremediably impels the masses to gather into a cosmic ritual of solar burning fuzz and reverberated atmospheres. Driven by the huge success of their eponymous debut record, which was recorded in the Bardenas desert and released in 2011, the Bordelais were quickly invited to play on the largest European stages alongside Kyuss Lives!, Dinosaur Jr, Sleep, and renowned festivals such as Eurockéennes de Belfort (Fr), Roadburn (NL), London and Berlin Desertfest, Sziget Festival (Hun), SXSW (USA), leading them to play in more than 20 countries. With their incredibly heavy and enthralling performances, MARS RED SKY have won unanimous support among the international rock scene. In 2012, they paired up with French doom metal monsters Year Of No Light to release a 3-track split record, which sold out quickly. The release of the “Be My Guide” EP in the spring of 2013 prophetically opened the path for another extensive tour across Europe. On the fall of 2013, the band flies off to South America for a twelve shows run. The recording sessions that were initially planned with Harper Hug in California, get cancelled due to unfortunate circumstances with the US administration. 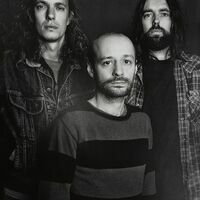 The band is forced to land in Rio de Janeiro, where they record their second full-length « Stranded In Arcadia » at Gabriel Zander’s Superfuzz studio. Within a few days, the band wraps up a total of eight tracks, while Gabriel Zander embraces the whole energy to proceed to its mixing. One good thing leading to another, MARS RED SKY inks a deal on Listenable Records and release the album in April 2014. With « Stranded In Arcadia », the trio takes its music to a brand new level: heavier than ever, this record embarks you further into their very own world of fuzz and psychedelia, a journey to a wondrous imaginary place called Arcadia... Widely acclaimed by both the fans of the genre and the press, it gets quickly considered as a « masterpiece » (Metalmouth) or a « psych rock piece of excellency » (Rock Hard Germany). In the wake of this release, the band joins French rock band Detroit on tour - including a show at La Cigale in Paris - after which they are invited to open the 9th edition of Hellfest under a packed Valley tent. Writer: Peter Wichers / Composers: Peter Witchers / Other contributors: D.R.